YOU CAN STICK IN YOUR POCKET AT AN AMAZING PRICE! The Nano Countertec Micro Sized Countermmeasures kit consists of the Bug Tracer And Tel-Guard Security Which You Can Stick In Your Pocket And Perform Both a Bug Sweep And And Insure Telephone Privacy No Matter Where You Go! You asked for it, we got it! 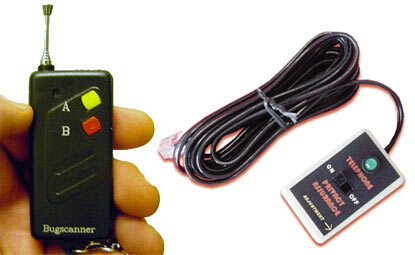 The amazing Mini Bug Tracer RF detector is great for finding those hidden 2.4GHz wireless cameras. Outstanding performance in a small package. Keychain sized detector with telescopic antenna sniffs out hidden wireless cameras fast, assuring your privacy. Red light flashes faster as you get closer to the hidden camera. HI/LO buttons allow you to check out the entire room, then "home-in" on the bug. Wide Range Detection: Ranging from 1MHz to 3GHz/3000MHz. Adjustable Sensitivity Selections: Allows the user to pinpoint wireless hidden cameras to within 6 - 8 inches when using the "B" button. Mini, pocket size, small size makes it easily portable. Carry it everywhere. 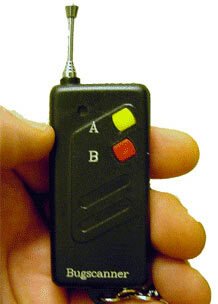 Detecting wireless bugging devices such as telephone transmitter and hidden microphones. Power - uses (1) 23AE (12V) battery. New Nano Technology Combo Special! ADD THE TEL-GUARD AND SAVE $10.00! And Common Types Of Wiretaps! Saves You $10.00 Over Normal Pricing!